lessons | Another dot in the blogosphere? It is time for a curmudgeonly rant. Some schools and parents here seem to have forgotten to teach kids the basis. I am not referring to the three Rs. What happened to speaking in hushed tones when in a shared or public space? We already live in cramped environments in Singapore. This alone is a good reason for not talking loudly during conversations over a meal or when packed on public transport. A lack of volume control reveals a lack of self-awareness and is inconsiderate to others who do not want to be audience to your conversations. What happened to taking care of personal property? People routinely leave their bags and computing devices in fast food joints or coffee places. The onus is not on others to look after your stuff; it is yours to care enough to leave someone behind or to take your things with you. There is a reason why they are called valuables — someone had to work hard to make the money so that you have that personal property. Be grateful, not careless. What happened to taking care of shared property? There is no learning if kids know how to return food trays in school but do not consistently do this at a mall eatery. There is no care if you use a toilet properly at home but somehow lose your aim and decency in a public restroom. And yes, this rant is fresh. I am drafting this at a Starbucks while surrounded by people who talk loudly and who have left a handbag and two computers at their tables. There is no toilet at this establishment, but there is one a stone’s throw away. Someone decided to pee in a sink. Maybe I should create an option in my education consultancy called Human Decency 101. But here is the sad news: If you need it, it is probably too late. 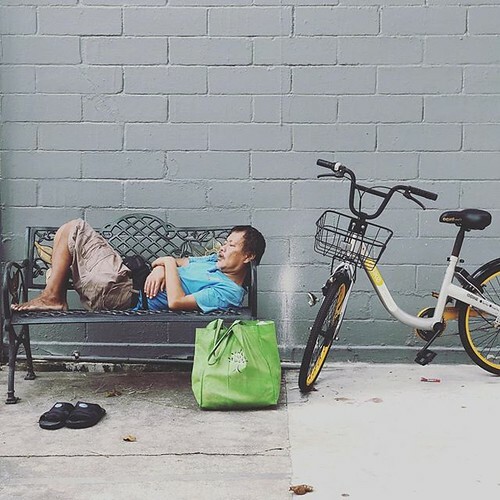 There are many fallouts from local shared bike company’s (OBike’s) withdrawal from the market. The one that seems to concern users is the inability to get a refund of their deposit when they first signed up. I am not sympathetic to those users because the company offered to return the deposits last November. I know because I was also a user of those shared bikes, made a S$49 deposit, and got it back when I read the notice. You would need to have been illiterate, blind, or deaf to miss that message. The offer was made six months ago and they have had all this time to get their money back. Even more serious than the inability to read, see, or hear the news is an indifferent mindset. We have only ourselves to blame if the warning signs were there, but we chose to ignore them. Something similar could be said of teachers and constant change. Rarely does a policy or practice sneak up on you. If you cooperate, collaborate, and communicate, you should sense the changes coming. You can then prepare for them by changing behaviours in advance. We cannot expect our children and students to be have “growth mindsets” or to exhibit “grit” if we ourselves do not possess these traits and model them. Like jet lag, some takeaways from my recent trip to Amsterdam only just hit me. Take trash days for instance. I opted to stay in someone’s entire apartment and we had to take bagged trash out to the street every Tuesday and Friday. There were no trash bins on the road, but everyone seemed to understand the importance of preparing and arranging the trash responsibly. The instructions to use the washing machine in the apartment were in Dutch. This was despite the assurance I got from owner that they would be in English. Thanks to a speedy Internet connection and phones, we got translations on the fly. Collectively, these reminded me that some of the best ways to learn are by embedded experience, close observation, and just-in-time information. Before my trip, I read about the differences between coffee houses vs cafés. If I wanted actual coffee, I had to visit a café. Marijuana was sold at coffee houses. Lesson? It is one thing to read or hear about coffee houses vs cafés, it is entirely another see — and smell — the differences in person. During my trip, I was told by a guide that Amsterdam had the highest per capita coffee drinkers. I took that as fact. Now I realise that I should have asked him which plant was involved. I also discovered that quite a few cafés and eateries play reggae music. I do not know if this is a homage to pot culture. Yesterday I shared some simple and general things I learnt from my visit to Amsterdam. Today I share what I learnt about the people I met and even those I did not meet in person. The Dutch seem to possess a dry wit. I know this from the way street artists and window dressers expressed themselves. The people I dealt with — from the public transport ticket agent to the sandwich lady to the SIM card guy — were very direct. Their mindset could be represented by this sign I saw at a knick-knack shop: Be nice, or go away. I was nice, so I did not go away. But in being nice, I used phrases that did not work. For example, I revisited a sandwich shop that I chanced upon and discovered that the friendly old man was replaced by a seemingly uptight lady. Me: I mean… Are you ready to serve? She: Let me wash my hands. She: (At the sink area) You can order. I am not facing you, but I can hear you. I made conversation about meeting the old man who told me that they were going to sell piccante, a spicy meat. I ordered two piccante sandwiches and my wife wanted two small slabs to bring home. While the sandwiches heated up, the lady cut a few slices of piccante for us to nibble on. I not only learnt where the best sandwiches in Amsterdam were, I also learnt how to be more direct with the Dutch. The Dutch in the service industry were also prompt. Very much so. I only exchanged emails with the host of my apartment. He said that he only had a landline, but I suspect that my emails to him were rerouted through an app on his phone or computer. Our email exchanges quick that they felt more like being on WhatsApp. I wanted to know if I could get a mobile-based ticket by choosing time slot online with my I Amsterdam card. I emailed the museum and got a reply. The bad news was that I had to queue twice. The good news was that the reply arrived within an hour. Some folks here take pride in being efficient or productive. I challenge that notion with the museum example. I also provide evidence of how slovenly we can be by comparison. Upon returning to Singapore, I learnt that my telco had disabled access to my account information. This was true for the mobile app and the web-based portal. I emailed my telco three days ago and have not received a reply. Not even an acknowledgement. In learning about others, we learn about ourselves. When we look in that mirror, do we like what we see? Do we do something positive about it? I like travelling because it is an opportunity to get out of my comfort zones — physical, mental, cultural, etc. The dissonance makes me learn. Here are some things I learnt from my trip to Amsterdam, the Netherlands. Several Instagram embeds to follow. Due to the Dutch net neutrality law, VoIP and tethering will not be blocked and traffic will not be prioritized. We are spoilt in Singapore as tethering is a given. However, even infrequent travel overseas has taught me that this practice is a rarity. When we arrived at our apartment in Amsterdam, I got to try two new iOS features: 1) Using the camera to scan QR codes at the back a router, and 2) quickly sharing the gobbledygook wifi password with iOS and MacOS devices. This meant that just one person needed to scan the code to join the WiFi network. When others wished to join the same network, the first person would receive a prompt to tap on to help the rest join. I had heard about the steep apartment stairs, but not experienced them first hand. The stairs are more like spiral or near-vertical ladders. With the equally famous commute-by-cycling, it is no wonder that the locals looked fit! I also noticed that most of the apartments and offices had no curtains. We were able to admire the interiors of homes and offices from the streets and canals. We were able to look right through our immediate neighbour’s apartment to the next building which also had naked windows. The large windows let the natural light in and this probably helps with warming the place and keeping the mood up. The openness also allows people show off their interior design and/or keep their rooms neat. Most museums in Amsterdam offer audio devices as guides. The Rembrandt House Museum not only offered multiple languages, it also had a kids version. It was storytelling at its best and I wonder why they even bother with the adult version. I already know that Google Maps is the best friend of the independent traveller. I discovered that Amsterdam is one of the rare cities where the shortest travel time often is by bike or on foot, then tram or bus, and finally by car. Tomorrow I share some things I learnt about the Dutch people.